Holiday Stress: How to balance your hormones | Syringa Inc.
Just a quick reminder that Holiday stress wreaks havoc with your hormonal balance. Progesterone is a precursor to a class of hormones called corticosteroids, which include your anti-stress and anti-inflammatory hormones. When you are stressed out due to planning, traveling, cooking, shopping, etc., your body will use as much progesterone as it can to manufacture the hormones needed to counter stress. This can leave you with less progesterone than your body needs, thus leading to symptoms of hormonal imbalance. At times of elevated stress you’ll need to use more of your Resolve Wild Yam Cream than usual. 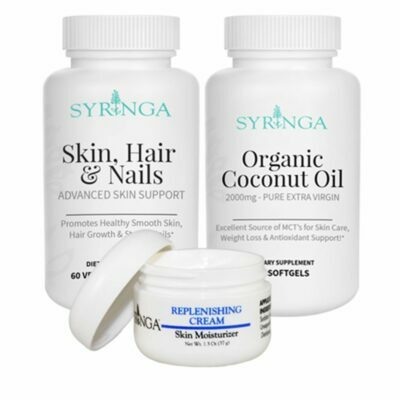 I would recommend using Syringa Organic Coconut Oil and Women’s Multi-vitamin along with it to provide your body with even more of a boost. Organic Coconut Oil supplements provide the body with the needed trans-fats and good cholesterol the body uses to make pregnenolone, which is the hormone the body uses to make estrogens and progesterone (the two main female hormones). The Women’s Multi-Vitamin was formulated specifically to complement the Resolve. It is rich in B vitamins and magnesium which are critical to the body when it comes to manufacturing hormones. It also contains herbs such as cranberry extract and wild yam along with others that address a woman’s unique nutritional needs. Right now you can purchase our Hormonal Harmony Essentials Pack which includes 2 Resolve wild Yam Cream, 1 Women’s Multivitamin and 1 Organic Coconut Oil supplement for a discounted price, only $71 (limited time only)!